We drove to the other side of New York to visit Lake Ontario again. This time we saw the lighthouse at Sodus Point, New York. There is a museum here, a nice park, and a refreshing jaunt down to the water’s edge. 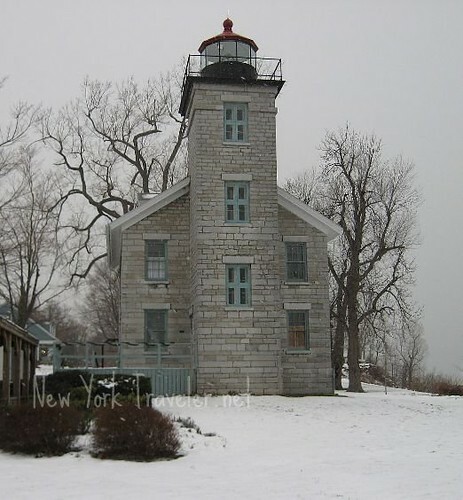 Very few places are open during the winter, and the lighthouse museum is no exception. But we love the lake, and having seen it in the summer, we wanted to see it in the winter, too. We got the added benefit of experiencing lake effect snow firsthand, too (without having to wait for the snow to blow across the state to Central NY, where we live). 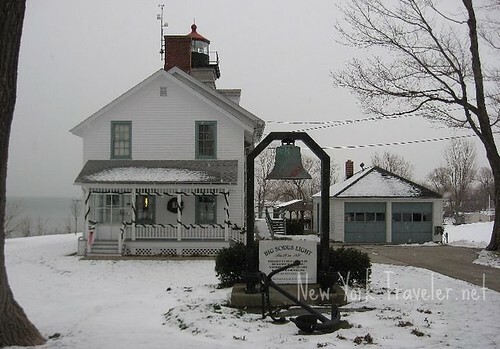 Sodus Point is in Wayne County, and the place has a lot of history. The town was formed in 1789. It is said that the name “Sodus” comes from an Indian word “gleam in the water.” I didn’t see too much gleam (due to the thick clouds and snowfall), but I did see an overwhelming multitude of apple orchards. I have never seen so many apple farms and orchards as I have in this location in New York State. 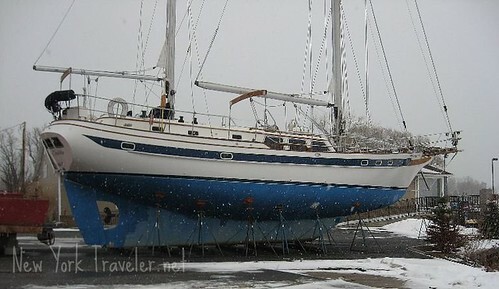 Sodus Point has a lovely, natural harbor, and became a central port in New York State for trading along the Lake. As it’s importance grew during the early 1800s, and as America and Britain were clashing over sea trade agreement, it is no surprise that Sodus Point became a target. The village of Sodus was burned and destroyed by the British in 1813, during the War of 1812. After the war, it was rebuilt again. Sodus Point is now a popular vacation resort. The lighthouse on the premises was built in 1871. 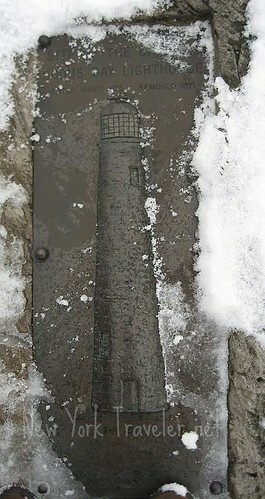 It replaced one that had been built in 1824. The lighthouse no longer functions as a lighthouse; it closed in 1901, and is now a museum. The grounds are very nice, but sparse. There are benches. A worn path lead us to an ivy-covered arbor. Beyond the arbor is a stone with a plaque, commemorating the old lighthouse. From here, we wandered to the lake. Great thick sheets ice covered the sandy beach. Waves crashed into the ice, producing sprays of icicles that sometimes went airborne. Our feet crunched on top of the ice. The edges of the ice looked like the baleen of whales. Underneath these “teeth,” the water rolled, causing the ice to emit crackling and groaning sounds. We dared not move too close to the edge of the ice. The kids collected seashells (even in the snow!) and did their usual exploring. The snow was beginning to fall heavily. We decided to trudge our way back up the hill and drive around the lake edge. Sodus is a little town. I think the population is about 1,000 or so. Many of the houses looked weary. Then again, it was winter and the clouds were thick and gray and overcast everything with their gloom. The falling snow made the scene cheerier. This cute tree caught my eye. 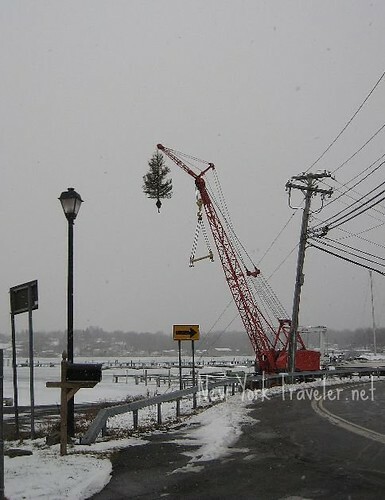 It’s a Christmas tree, fully decorated, hanging on a crane! Funny! And this little red tugboat looked so perky, despite being beached for the winter. This section of the lake (the marina) was frozen over. I wish I had been able to take a photo of what we saw next– people atop these little sailboat-like boats scouring the ice. The sails were white but the boat was bright yellow. There must have been skis or something like it. The wind was blowing and the skiffs were shooting across the ice very quickly. It looked like such fun! I was driving when we saw them and couldn’t take their picture. Sorry. It was so neat to see them! We got a few pictures of the boats. They were covered with bright blue tarp, but looked sad underneath. I guess I’d be sad, too, if I had to sit out winter on the ice, waiting for spring to be free again. We did see large areas of open water. Signs spelled it out for anyone who didn’t notice: “DANGER. Open water!” We saw people all over the ice. Some folks seemed to be out for a stroll on the lake; others were fishing. Brrr. It’s looking blustery on the lake by now. I don’t know if Lake Ontario freezes over during the winter. Anyone have any ideas? My kids say it doesn’t, because the lake is so active. This winter has so far been rather mild (with only a few days below zero so far), so this year’s weather may have changed the outlook. 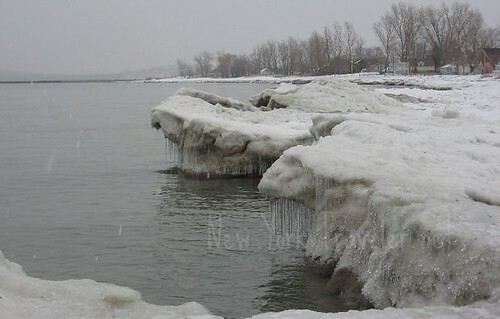 Does Lake Ontario freeze over? The weather was turning more threatening, and the skies were growing dark, so our travel here had to end. We will return in the summer and explore this end of the lake a little more next time. Life by such a large and influential lake is so unique. An entire subculture grows around it, I’m sure. I’d love to visit during a fishing event or when cargo barges come in. I’ll bet there’d be a lot of action then! If you are a fanatic traveler, do you need to find the best RV Camping? No matter where you travel to, our website will put you in touch with the best RV parks, RV rentals and RV Supplies! No matter what type of RV you own, we will find an RV to accommodate! You can even buy an RV online! I don’t believe that Lake Ontario ever totally freezes over. In very cold years it will freeze out a good long way and the lake effect snow will be drastically reduced. Bitter cold or lots of snow – what a choice! Lake Erie does freeze over and that is why Syracuse wins the golden snowball most years. Wayne county is beautiful! Visit Martha who lives by the orchards. My ancestors hail from Wayne County, so it was nice to travel in the area. Ugh! “Bitter cold or lots of snow”? I did take photos of Lake Ontario and that is real ice in the photos. And there was a real worn path! Sorry you don’t agree, but I did not see you there when I took the photos! 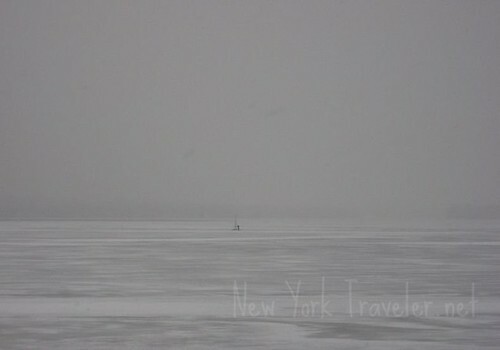 I love the winter pictures of Sodus Point. All of us former residents are in touch on Facebook. 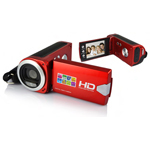 We would love to post your photos. 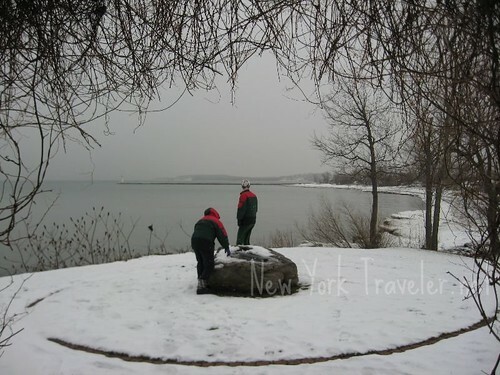 This is what we enjoyed during the winter as children during the months when there were fewer tourists. We went ice fishing, sliding, skating, hiking across the ice to our three islands, ice boating too. One Spring school day, our pastor saw from the parsonage windows,all the ice flow out of the bay in one days times, little iceburgs bobbing along. A couple of winters the ice was so thick that people out driving drove out on the ice, lots of cars out on the bay driving about as if in a boat. Mother pointed out a couple of childhood haunts of her own to us all as we went.